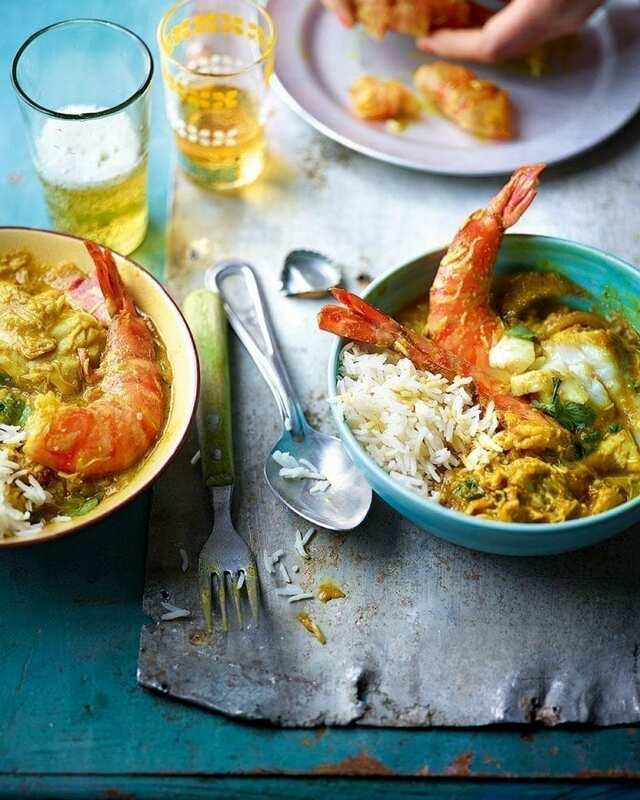 Prawns, crab and fish soak up the bold Thai curry flavours as they cook in this golden-coloured sauce. It’s an excellent dinner party recipe which everyone will love digging in to. Or go green instead with our Thai green chicken curry. Whizz the curry paste ingredients with 150ml water in a mini food processor (or pound to a paste in a pestle and mortar). Set aside. Heat the oil in a large, deep frying pan over a medium-high heat. Add the onions and fry for 5 minutes or until they start to soften. Add the curry paste and brown crabmeat, then cook for 10 minutes. Add the coconut milk, half the lime juice, the sugar and fish sauce. Simmer for 5 minutes, then add the white crabmeat, prawns and cod. Simmer for 5-8 minutes until the seafood is cooked through; stir gently and occasionally to avoid breaking up the fish. Add the coriander and remaining lime juice to taste, then serve with steamed rice, if you like. Taste as you go and add salt to taste. You may also want to add more fish sauce. Make the curry paste up to 1 week ahead and keep chilled in a sealed container. Good seafood flavours, would do this again with monkfish.